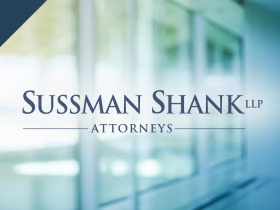 Sussman Shank continues its nearly 60-year legacy as one of the Pacific Northwest's leading commercial litigation law firms. Our litigators advocate for clients in all types of complex commercial and business disputes, seeking intelligent, client-centric resolutions from juries, judges, arbitrators and mediators. We have extensive industry-based trial experience, including in financial services, manufacturing, health care, real estate, construction, agriculture and technology. Our trial bench often appears throughout the United States, and includes attorneys admitted to practice in federal and state courts in Oregon, Washington, California, Idaho, Illinois and New York. Represented premium apparel maker in a successful two-week trial, and obtained a jury verdict in excess of $11.3 million against Japanese distributors for breach of contract, trademark, and fraud. Represented Canadian franchisor of "Booster Juice" fruit smoothie shops in defense of two complex U. S. arbitrations in which franchisor won on all claims and obtained award of attorney's fees. Represented national commercial truck lessor in breach/termination of lease litigation, including obtaining provisional process order requiring lessee to turn over all leased trucks to lessor prior to litigation of damages case. Enforced commercial landlord's lien, blocking tenant's removal of valuable inventory, and later foreclosed lien and applied sale proceeds to landlord's lease damages. Represented high-tech company in defense of claim by early prospective investor asserting an oral contract to receive a substantial percentage of stock in the company. Successfully defended company owner in lawsuit filed by another owner claiming breach of duties of loyalty and care, in which plaintiff sought to oust client from the company. Represented limited liability company sued by a former member for wrongful expulsion and breach of contract, alleging $6 million in damages. Case was resolved by a complete defense decision after arbitration, including a six figure damages award on counterclaims. proved key to a complete defense trial verdict. Represented subsidiaries and affiliates of Realogy Corp., including Coldwell Banker Real Estate LLC, ERA Franchise Systems, LLC, and Century 21 Real Estate, LLC in defense of consumer class actions alleging unfair business practices and violations of the Real Estate Settlement Procedures act (RESPA). Represented an Oregon family-owned business in successful suit against international IT solutions company headquartered in Canada for breach of contract, negligence and violation of Oregon's unlawful trade practices act. Defended motions for temporary restraining order and preliminary injunction alleging fraud and unfair trade practices, which would have resulted in cessation of client's operations. Filed suit against general partner of a limited liability company for fraud, conversion, breach of fiduciary duty in Dallas County, Texas state court, ultimately recovering a substantial amount of client's losses through a settlement payment. Successfully resolved litigation in United States District Court against the chairman of the board of a bank holding company asserting more than $5 million in damages for breach of fiduciary duty with insurance company funds. Sued former officer and employee of a construction company for fraud, conversion and breach of the duty of loyalty. Represented a consortium of creditors known as the "Epic Seven" to recover their partially-built private jets locked within a Bend, Oregon aircraft manufacturing facility operated by the debtor. Debtor was accused of fraudulent misuse of the creditors' deposited funds and mismanagement, and had blocked off access to the facility without warning. Successfully sued to obtain the appointment of a Trustee to oust debtor's management and recovered the jets. Sued defendant who had forged documents to induce client to make a payment that was not owed under the parties' contract. Represented Receiver in suit by secured lender to take possession of downtown Portland building mid-way through major renovation. In addition to the lender's lien, there were multiple construction liens with the building only partially complete. Obtained an order staying the foreclosure action and assisted the Receiver in negotiating settlements with the lien claimants, including devising an inventory and claiming procedure to resolve claims to a substantial amount of personal property and construction materials locked within the building. Represented client in successfully obtaining foreclosure of a security interest in four large construction trucks, including locating the collateral which had been hidden by the debtor after entry of judgment. After entry of judgment, conducted investigation of debtor's assets, discovering substantial holdings of real property in multiple states. Immediately acted to obtain judgment liens on all the real property, so that client had superior liens over competing creditors. Client obtained the first right to proceeds from the sale of debtors' properties whereas other creditors were unable to realize full recovery. Represented bank in fraud case against debtor who transferred assets to multiple states and countries. After obtaining a nearly $2 million judgment, we pursued post-judgment enforcement actions, and located, seized, and forced the sale of multiple assets to satisfy the judgment. Represented client in full collection of 10 year-old support judgment after conducting due diligence to determine the debtor was the beneficiary of a trust. Transcribed the judgment to a different state and issued a garnishment to the trustee before the trustee distributed the assets to the debtor. Represented insurance company in obtaining summary judgment where insured submitted fraudulent documents in a valuation dispute over a substantial claim. After discovering forged signatures, we asserted counterclaims based upon the concealment and fraud exclusions in the insurance policy. Represented a food processing company in persuading its insurance company to settle a wrongful death claim filed against our client so as to avoid the time of a public trial and the risk of an award in excess of policy limits. Obtained defense verdict for insurance company after two-week trial in a case involving allegations of unfair trade practices and bad faith.